Available in the following lengths: 9', 12', 14', 16', 18', 20' and 22'. Your choice of 16" or 20" solid maple playfield featuring a poured polymer resin coating to protect your playing field from any damages. Includes pucks, wax, liquid wax, glaze cleaner and a sweeper for removing wax. Solid maple shuffleboard table available in many lengths and finishes. Beautiful modern look with just a touch of flair. Made to match the Olhausen York pool table, but perfect on its own also. 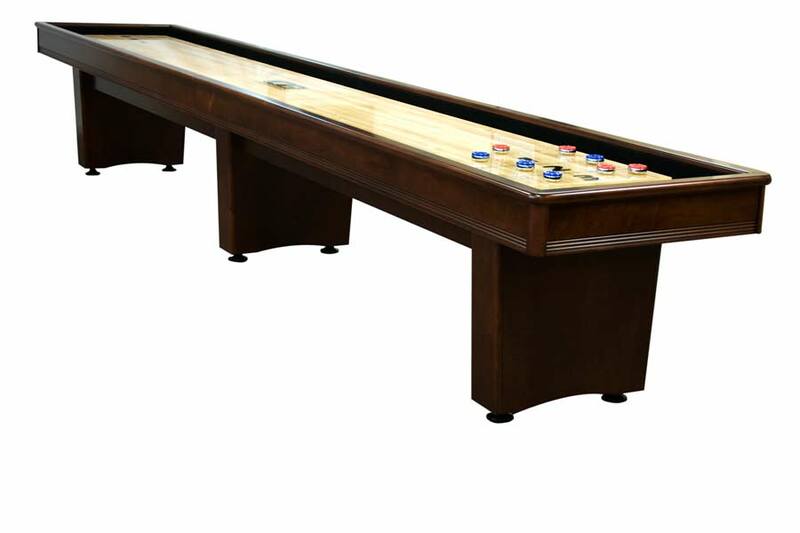 Shuffleboard tables may be long, but you only need access at the ends, so they can easily be tucked along a wall to give you plenty of space for anything else you want in the room.